Forest School is a unique and inspirational learning experience, that improves self esteem, confidence and abilities. It's usually delivered as a long term programme of sessions centred around outdoor education and play in a woodland environment. 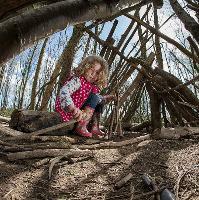 This session is an opportunity for families to experience a Forest School session together at Brockholes. The sessions will include an environmental activity, snack time in the woodland (included in ticket) and an opportunity for play and discovery! Please come dressed for the weather so your family are comfortable and able to make the most of the experience. Please wear wellies or sturdy boots and bring waterproofs. We advise wearing long sleeved tops and trousers. Any on the day tickets are subject to availability and subject to additional charges of +£1.00/Individual Ticket and +£2.00/Family Ticket.